Finally done with a simple theme called Blue Rooster. The theme is a two column layout with a extra templates that can convert your blog into a CMS. The sidebar and footer are both widgetized, author and category templates included, as well as social buttons already intact. The theme style is a mix of rounded corners, flat edges and wooden elements with a schema of muted, dark colors on a plain white surface. Blue Rooster is free under Creative Commons license. Blue Rooster is ready to use out of the box. The standard blog template will work with or without assigning thumbnails to your posts. In order to use thumbnails – you would have to assign custom fields to your posts with name: “image“. 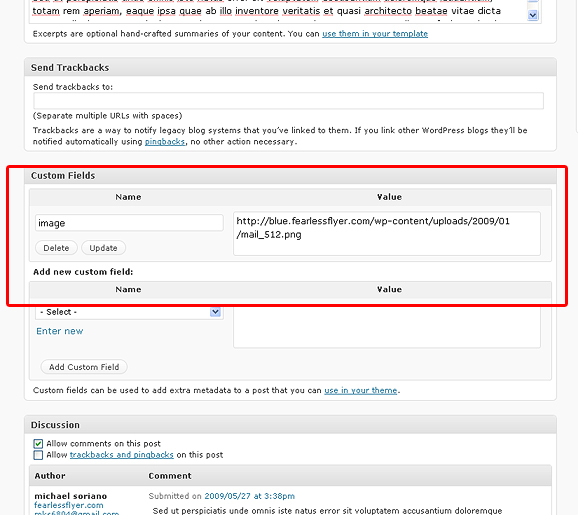 To learn more about custom fields – check this link from the WordPress Codex. You DO NOT have to resize your images for the thumbnails, thanks to the Darren Hoyt for his TimThumb script which made this all possible. The thumbnails are also powered by jQuery: PrettyPhoto – which is a lightbox clone where the larger images are displayed when clicked. A link to the single post is also included with the larger image. If you want to use the slide show in the front page – just apply the template “template-home” to your home page. Then make this page the static page of your site. To customize the slide show – simply replace the images in the images folder. Note that there are two sets of images: the larger image and the bottom bar. The active state and non-active state of the bottom bar matches the larger image. The Testimonials section in the template are actual posts under a category: testimonials. Simply create this category and start creating posts under it. The testimonial author works as the title for this section. The Photo Gallery page is as simple as applying “photo gallery” to a page. The images in this gallery are automatically populated from your custom field thumbnails. So in order for this to populate – you must use thumbnails in your post. A custom login form is built in the header which is also jQuery powered. Once logged in will give you quick access to the dashboard, as well as quick “Edit” links after each post. The single post page includes an author information which feeds information from your user profile and Gravatar. So to utilize this section – your user information and gravatar must be filled out. The comments section support threading and pagination. In the template file called “template-home.php” is a section called “rotate” (means a div with an id named “rotate”). Within this rotate section, is a series of empty divs that have different ids – namely: fragment-1, fragment-2 and fragment-3. Even though these fragments are empty – they are styled with a background image in the stylesheet – so they appear that they have a large image. You can enter anything inside these fragments as you wish (text, other images and even links). Now it’s totally up to you to change the background image, to fit the new link. It is also up to you to change the “style” of the link – to make it into a button, a large image – whatever you wish. As mentioned, these div fragments are empty – so you can add anything you want. You can download the theme from this link. Additional documentation can be found in this series of posts. Don’t forget to leave your comments below. Additionally – custom fields don’t seem to appear when I post using this theme now? They work under the standard theme? I’m trying to remove a few things but having read the comments I can’t see how it’s done – hopefully you can help? I hope you’re not tired of me…but spoke too soon…could you take a look at this page and tell me what you think the problem is….somehow the thumbnail images don’t show…you’re demo shows beautifully….http://captivatebymobile.com/find-your-business-here now where the images are supposed to be show by the thumbnails don’t appear either…you could also check out the “New, View, & Trends Tab” (blog page)…the thumbnails don’t appear either. Forget about my nit-pics and worries!!! It just took a minute for my browser to catch up I imagine…..All’s Well!! Sorry for the duh moment!=) Got it!…But are you having any trouble with timthumb, because my thumbnails still aren’t showing up…the darnest thing! Was hoping the fresh theme would fix it…any ideas…Don’t want to go chopping up this install like i did the last one. BTW Theme looks damn good! I’ve downloaded all the latest jquery downloads, and I called myself replacing all of the old jquery files with the updated ones, but because I’m not confident toying around too much with the theme and php writing, I’m not quite sure how to make the theme call up the new info, because simple replacement apparently wasn’t enough. I’d read in a few forums that all you needed to do was upload the new versions and presto changeo everything would be alright….No luck for me, however. It must be a “global” type of thing, because I’ve noticed that this site’s (fearless flyer) scripts stop running frequently while I’m visiting the site FYI. BTW…I downloaded Shadowbox 3.0.3 and Lightbox 2.0.4 scripts but afraid to move forward w/o guidance..
Have looked at your tutorial for fancybox and timthumb, and would like to use it for individual pages, but not sure where to place it in the BR theme. (i.e, Where to appropiately place scripts in header, then on pages, then in functions, then in css…. )….especially since timthumb is not recognizing images in my site. Hope to hear from you soon with any suggestions you may have…your tutorials are the best “print” tutorials in my opinion and I will follow whatever you suggest. I’ve updated the theme. Download and replace yours. I just updated to 3.1 and it broke my prettyphoto in this theme..
Have yo encountered that problem? And is there a recommended way to address it? Tried to replace prettyphoto with new version(?) that didn’t work too well. It used to be so beautiful 🙁 Do have a backup, but like to update for security. Hi, I just found this theme and i love it very much! thanks for your awsome theme. I have a small problem with post image. I created 3 post and put in the image link in custom field. Only 1 post captures the image. While the other 2 post only display grey box. What could be the problem? Need advise. thank you very much. make sure you’re using images that are local. I see images in image folder but how to tell sidebar which image to choose? It says: class=”spot”>ad after the href. How/where to change class? Spot? confused. Michael – what a great site. I’m doing a WP site for a friend and this is perfect, but can I replace the overall bkg (the dark wood panelled wall on the demo) ? I’m not the techiest – but think i can move around enough to do it if possible. THANKS! Hello, I’ve read all of the comments above and I’ve tried everything but I still can not get the images to load on the photo gallery. Does it matter that the page is called something other than “photo gallery”? I’ve changed permissions on all the images and the timthumb file and it still will not work. Please help, this theme is awesome and I really want to make it work. the page name doesn’t matter. the photo gallery template gathers all of your post “custom-field” images and displays it gallery style. so if you don’t have posts with custom fields – nothing will show up. I have added the custom field and link to the post but it still doesn’t work. I’m sorry to be a pain in th a** here. how if i just want to display image from certain category post in gallery page, and not display image from other category post. Hi, I like this theme very much, it’s a good job！But I can’t find link to download this file, could you tell me? THx a lot! I like your unique theme. thank you for sharing. How do you remove the related posts from every page?? I don’t want it on there as it’s just too much. Where do I go to remove it? Excellent look theme – very unique. Any plans on making this theme BuddyPress Compatible out of the box? Would be willing to pay for it, specially for the homepage setup. Hi Michael, I’ve lloking for theme like this for ages. Superb! I noticed that a lot of the commenters aren’t reading othe rcomments and you need to keep answering the same replies repeated! Ok, I’ve figured it out. I had to update the version of timthumb. I know you don’t give free support anymore, but couldn’t you have at least made that suggestion? I’ve been trying like crazy to figure out why it wasn’t working. Ok, I’ve contacted my host again and they say they’re seeing a 404 error coming back from the timthumb script and they don’t provide support for 3rd party scripts and that I should contact the script writer, that’s you. Please help me figure out why it’s not working. Love the theme! My recent posts won’t show up in the recent posts section. Is there something I can do? Thank you for this really nice and visually appealing theme, came in very handy for a new blog I am promoting. I just cannot get my photo gallery page to work. I’ve set the custom field to image and used many different settings in value – full url, just the /images/image.jpg link, and tried other ways…it’s all blank. What do I do? And please tell me how to assign full width to pages. Thanks. Hi. Love the theme. I just can’t get the image slider to work. Right now it is showing your default images. I created a post, added a custom field with the name image, i put the url of the photo in the value box: http://addthistomycar.com/wp-content/themes/blue-rooster/blue-rooster/images/3YR-WARRANTY.jpg and still nothing happens. Any advice? How do you set a full width to some pages? Really Nice theme! Good coding and great clean design, will use this for sure! Just want to say what a fantastic template this is! I found it pretty easy to set up and customize! You’d done a fantastic job and I think I’ll be back for more! Michael – I love this (and many more of your themes). I’m having an issue with this one currently however. After install WP keeps telling me that the install worked but I can’t use the theme due to a missing stylesheet. Has anyone else had this problem? Is there an easy fix? i would upload the theme manually using ftp. first thank you for that nice theme. amazing! once the theme installed, it has the blue rooster logo. how can I change it? Just…..wow. You impress the hell outta me. Nice work, man – and thanks for making them free for those of us who are new to WP. hey! great theme.. for some reason when i click ‘next page’ on my gallery, it doesn’t go to another page – it just reloads all of the same pictures. could you please help and let me know what i should fix to make sure that all of the photos show up? For some reason, I am unable to change the logo. I when into the theme editor in wordpress, changed “logo.png” to my image in the Stylesheet.css, but for some reason, the logo is only changing when i view my page in IE. When i try to view in Firefox, the Blue Rooster logo is still there. When I try to view in Chrome, no logo is showing. Please help! I really like your theme! i love your template, am using photo gallery as main page, any chance u can show how to add additional info like in your freebies page under each photo ? and i like the fading hover effect as well. it would be awesome if u can show it. Thank you. How do I apply the template “template-home” to my home page?? Hi, awesome theme thank you… I however have an issue as the template static home template doesnt seem to show any of the recent posts? Very cool theme! I have been looking for something like this for a while. The images have to be local. Upload it to your server. also – make sure gd library is installed – inquire with your host. lastly – make sure “cache” folder is writable. Hi !!! Great Theme. I’m not clear on how to do the following. 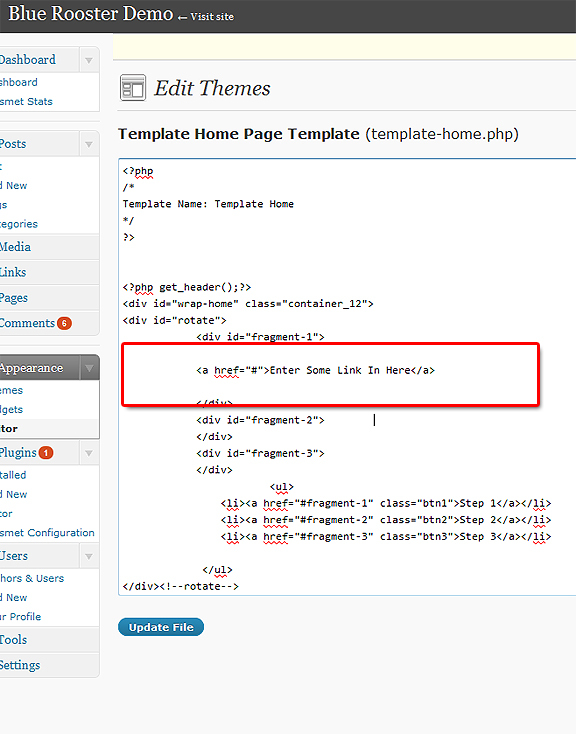 Create a page – name it home > apply the template “template-home”. then go into settings > reading – choose “a static page” and select “home” from the drop down list. Thanks, necessarily I use in practice, nice theme! First of all: great theme! but it wont work. Anyone managed to do this? I am a librarian building a non profit homework help website http://www.planethomework.co.uk I love this theme, looks fantastic in all browsers but tried it at the library today and realised that the Timthumb post images don’t show up in IE 6. Which is a problem as all my local libraries use IE 6 and won’t be updating soon. Any fixes for the php or CSS? I’ve searched but not sure what to do!!! IE6 is not supported. Not even by Microsoft. Hey I wanted to add a fourth slide. How do i go about doing that? And also, I wanted to add a larger logo for the header but it won’t let me it cuts off. Please help me! This theme is rocking! It’s hard to find good themes of this caliber without being REQUIRED to pay a penny. I salute the veteran designers for their continued support to us up and comers. Anyone can help me 🙁 ???? Just wondering if there is any way to pause the slides on hover? Should be possible to add a dropdown menu in header instead existing plain pagelist? I tried with some plugin and actually are workings, but the submenu are cut I suppose by slideshow (because submenu goes under slides) and, anyway, it’s difficult to apply the original cool style. Removed the “overflow:hidden;” in the stylesheet #header in order the sub-menu to show. Hello Michael. Thnx for the great work. I can not show up thumbnails. Im just having grey boxes instead of pics. http://ikisekiz.com/senak/ Do u think it’s same problem? having the same issue as Marco. Would love to know how to fix it. Hi, I’m using this template on my wordpress, but I don’t know how to apply ‘template home’ to my home page. The instructions above say to ‘apply’ template home to your home page but I don’t know how or where I can change my homepage, is it something in the ‘codin’? I’ve looking and trying for the last two weeks and no luck, please can someone guide me!!!! create a new page – call it “home”, in the right hand section – under “template”, select the template from the drop down list, save changes – view page. It seems like I am having the same problems as other in this discussion. I can’t seem to make ‘template home aka home, my HOMEPAGE, can you help with that please? check “settings”, “reading” – edit options there. Hi! Fantastic theme – thank you! But there is one problem – many people use AdBlock and “RECENT POSTS” section is not visible under this plugin. the image redirection is necessary in order for your images to resize. 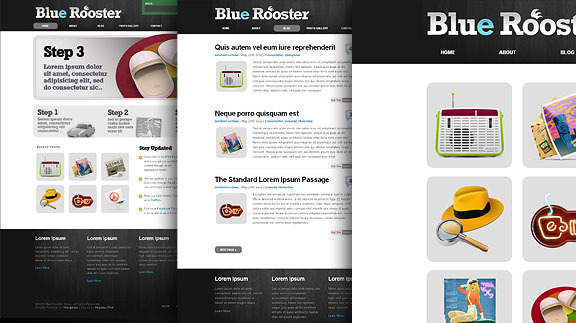 can i install payment gateway to Blue Rooster theme…both paypal and credit cards? sure you can. you need to implement the buttons manually. GREAT WORK! I have just downloaded and would love to know if there is a way to replace the “recent posts” section/ 3×2 image grid, with a regular Page, or textbox widget. is this possible. hope so! love it so far. it is possible – you would have to edit the template file in code. What code should i put in. I tried to replace it with different .php… but it seemd to clear out the etire section. i’d be REALLY great if i could just turn that whole section into 3 slots for widgets? possible? That’s incredible and cool theme. I’ve reviewed it in my site with great pleasure. 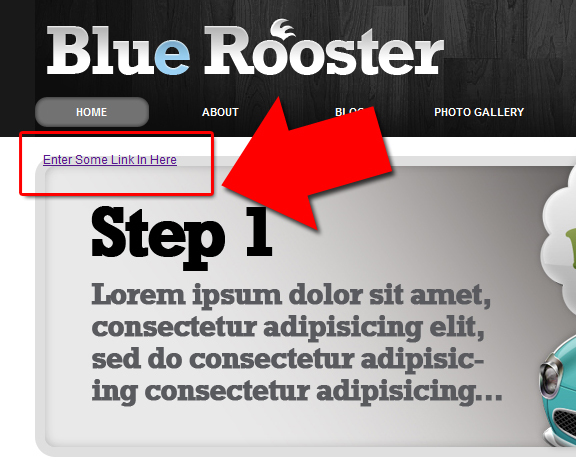 To use the “template-home “, the Blue Rooster theme, delete the file “index.php” original. However, when the system calls the “template-home” the slide does not work correctly. An image appears below the other. What should I do? Very awesome theme. I work with wordpress since a few time. I would like to use it for one of my web site. I would like to know if it’s possible to have the PSD file because i like to change the wood background for a plain color. The download links seem to be dead.. Morning, saw a tweet on Twitter and had a look. Great looking theme, however the download links don’t seem to work. Is it me or is there a slip up? This theme is GREAT! 🙂 Just retweeted it and downloaded it….I’m looking forward to getting into it. Hi, Michael.. I’m having an ISSUE. Fantastic theme, btw.. But, I would like to use the gallery a certain way. I’ve got it to work.. But I would like to know how to use it to display certain images, per section? For example, I want to have a Ladies gallery on one page and Men’s gallery on another. Each page would show all of the images, but would be separated by Ladies (tag) and by Mens (tag)? Please help. I’m on a timeline. you would have to create a new page template – modify the loop to filtered by specific tags. how to remove quick login? Wonderful theme, I love it and look forward to using it on my blog. The photo gallery is very well done but I have a small problem. It is based on custom fields “image” which means that the page will retrieve the images of all the notes on the page “blog”. I would like to use the page gallery to publish only works or photographs without making them appear more tickets blog. How can I create a new custom field to the gallery page? PS: On your blog you can see that the latest comments, it seems that a link is missing which prevents us from reading the earlier reviews. Hmmm. a new custom field is not the answer – you can do a special query for a specific category on the gallery page instead. This will pull only the posts from a designated category – still using the same “image” custom field. in your blog – you can “exclude” that specific category so they won’t show up. I can’t exculde a category only on “Home page” and “Blog page”. Can you help me please ? I want to see it only on “Galery Page”. Thank you so much, and I am ‘officially’ an idiot. This is one of the most amazing themes I have eve seen and used. It’s beautiful and full of surprises! I am trying to get the lower images on the slideshow work with the smaller versions of the large images that I have placed in the folder to replace the original ones from the template, but nothing seems to work. Do you have any ideas? you need to replace the image named “button-sprites.png” which is one big image for all the buttons and the hovers: http://www.infinityrealms.net/wp-content/themes/blue-rooster/images/button-sprites.png. you can also download the photoshop file from my downloads page. Again, thank you so much for the site and the support. I have MOST of the kinks worked out, but I am still REALLY struggling with the Photo Gallery. I believe that I have the DB turned on, and I keep putting the “prettyPhoto” in the “link rel” area in the advance picture area…and I STILL cannot get the pics to my photo gallery. HELP, please! @John – just to let you know – the “Photo Gallery” in the demo site is using the page template “photo gallery” – not the WordPress “insert gallery” from your uploaded media. The photo gallery template pulls all the custom images from your previous posts and displays them as a “gallery” – you don’t have to do anything like add a rel attribute etc. I love this theme it is perfect for a project I’m working on. How do I apply the template “template-home” to my home page in wordpress. I have it installed on my dashboard, but see no options for changing the template to Template-home? Sorry in advance for my ignorance. create a new page – name it “home”. 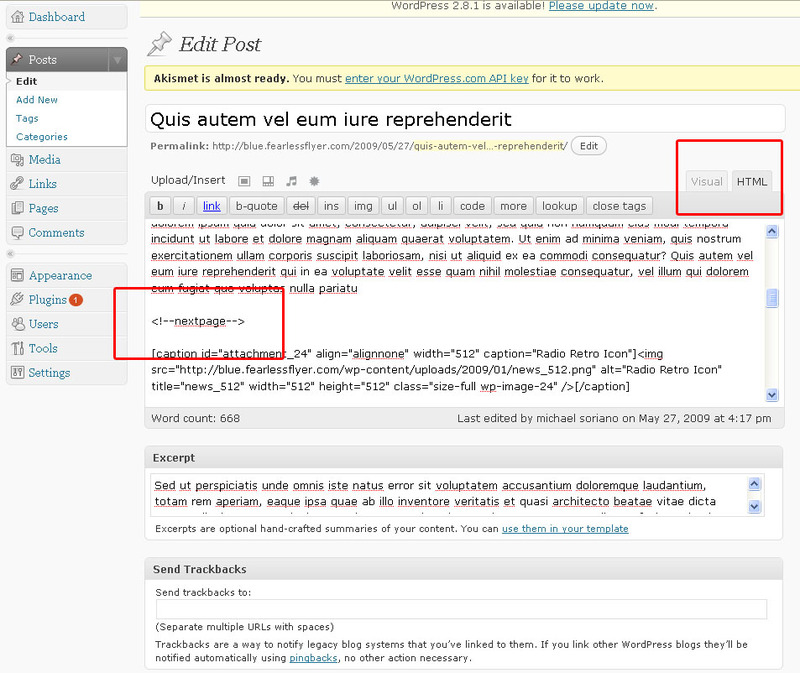 on the right hand side – under “template” select “template-home” and hit publish. is there a way to change the size of thumbnails? Hi, i love this template,but, what is the font? Just wanted to say great work, great design and great support. You are the reason people want to learn more, thanks for your time and efforts. Hi, a really great theme! Could some one please explain to me how to get the Blog function to work? Also I wonder if it would be possible to link the big picture to a specific page and different pages depending in witch picture that are shown? Oops cried wolf, too many plug ins activated. Is working now. I really like this template, but I broke the homepage template. Instead of the animation I know have 3 very large still images on the homepage. I’ll keep tinkering in the meantime. Hey is there any Solution to link the Slider Images? and thanks a lot for this great template ! it looks like you got it going. Yes, that’s working ok now ! Thanks again for your great theme ! hey gr8 theme i like it!!! Great site, thanks a lot. I followed your directions for making my “home” page the “template home”, but it still defaults to the blog look when I link to the page. Any ideas? I try to use custom field to give a thumbnail, but it doesn’t show up the image. How to fix this? Your hosting environment doesn’t have the GD library – or support Timthumb – Contact them for details. 2. I can not see the thumbnails in the gallery and also in the post sections. 1. The library automatically fills itself with the custom images you put in for your posts. I can almost guarantee that this is the problem: Your hosting environment doesn’t have the GD library – or support Timthumb – Contact them to enable this for you. Thanks a lot for the help i have been in touch with my hosting company they have fixed one domain with another theme but on you theme still there is some problem. They have created a ticket for that and will get back to me in 2-3 days. thanks for the self again. Yoooooo!! My Problem is solved. Thanks a lot for you time and help. while Doing all this and getting the GD library enable on my domain. I found out one more thing may be this can help to other people. If you have the GD library enable and the thumbnail script is working and still you are not getting the thumbnail then you must be doing this mistake. Pass the image URL which is on your domain if you will pass the url in the value field which belongs to another domain will not work. Thanks for the tip Avdhesh! I have send you a email on your email address. Can you please reply that if possible. First, awesome theme. I have been able to get the top slider images to change. When I replace the images for the part under the slider, those images do not change. Just to make sure I am doing it right, I am replacing the images titled “btn1, etc.” correct? TO EVERYBODY WHO WANTS TO KNOW HOW TO ADD LINKS IN THE SLIDESHOW, I’ve updated the post above. Read the section “How to enter links in the slideshow”. Hi there – I love this template! I’m wondering if it’s compatible with WordPress 2.7? That’s the platform available to me through my ISP. Thanks! Hello, Thanks for this great theme. One questions: can be translated? Best regards. Hello and thanks for this wonderfull theme. I have a question. How i can customize the “add blocks 100×100” image to be different in each block? I have tried and i can customize it but it is the same image in all blocks. That’s because I used the same image for demo purposes only. You would have to go in “sidebar.php” and edit the img src values, as well as the a hrefs. Just basic html. Hi again! What can i do to put the reply option in comentaries? Hello, I am building a site for a friend of mine using the Blue Rooster template, and for some reason, my frontpage slideshow is no longer working. You can click on my name to view the site, any help would be MUCH appreciated. That did the trick! Thanks for your super-fast response! I like this style and template ‘s color a lot. It look modern and professional. Wow Thanks .. I like this color style a lot. It s look modern and look professional site. I love this design, however mine looks nothing like the design you have here. I wish I could figure out the thumbnails thing. i have changed the smaller images below to match the ones i used n the upper slide show. however, the old images still show up. what might i be missing? the smaller images is only one image. Make sure that its the same name. Hello Michael, this is one of the most beautiful WordPress themes I ever see. You rock, kudos for that! Just for you guys who don’t know how to split a post into multiple pages, just use tag in your post. For “Blog” page to work, create it and choose “blog” under Posts page field in Reading Settings. Thanks again Michael… quick question (may not be a quick answer)… Is their an easier way to add “ad” images and links. Am I just not finding it? Love how this is turning out by the way. You know what… I did it the long way and it looks and works great. Thanks again for the theme. How would I create a sub-menu (child pages) to the existing menu system on this theme? And a beautiful theme by the way! Did you ever figure out how to create a sub-menu? I looked at the link for the suckerfish drop down menus but am still a little confused. Anything that you figured out would be helpful! Love the template. Thanks for the use. Is their a way to set the timing on the rotator for the home-page slide show? yes you can. in the theme folder, scripts, rotate – i believe it’s rotate.js – look for the number 2000 – increase to higher number. hahaha, its actually realy easy. Log in to your WordPress admin, go to Pages –> new page. Title it home, then go to the right sidebar where you will find the Attributes tools. There’s one called Template with a dropdown. Flick it and you’ll see Template Home. Apply and save and you’re good to go! With that done, you click “Home” and the formatted Home Page template shows, true enough, BUT, when you enter your site from the domain name, “Home” is not yet set to display as the Front Page, it ONLY when you click the “Home” link. To make the new “Home” page show as the HOME page, go to “Settings” -> “Reading” -> under “Front page displays” select a “Static” page and select the newly created “Home” page as the “Front Page”. NOW… You’re good to go. Hi Michael, this is really fantastic. I downloaded it earlier today (via Rapidshare cos the zip file was empty) and I’m working on it as we speak… The only thing I can’t get my head around is how to get a thumbnail in my post using custom fields and therefore generating a gallery. Sorry, but I’m a novice and any help would be greatly appreciated. Thanks in advance for all the great work! when creating a post – directly underneath there’s a section called “custom fields”. create a “key” with the word “image”, to the left of it “value” – enter the full url of the image you like. you don’t need to resize – it will do it automatically. Another quick question. Can I use prettyphoto for photos that are on pages too? It only seems to work with photos in posts and my site is basically all pages with just one page for the blog. If prettyphoto doesn’t work with pages, I’ll need to look for another lightbox. Do you have any suggestions? Yes you can – all you need to do is add “rel=”prettyPhoto” ” to the anchor tag of the photo. This will trigger the prettyphoto script. Thanks for answering Michael, but this just isn’t working. If I try to add the rel in the advanced link settings of a photo when editing the page, WP just refuses and no matter how I fill this in, it remains blank. Am I doing something really stupid…? I am having the same problem as Rosie regarding the blank page. the “rel=”prettyPhoto” ” method isn’t working for me either. Otherwise, excellent template! First of all: Congrats on a fabulous, slick and elegant theme. I’ve experienced certain problems downloading it, though. It would appear that the blue-rooster.zip file is empty. At least it shows up empty upon downloading it, unlike the blue-rooster-PSDs.zip file, which works according to your intentions, undoubtedly. I’m afraid I’m at my wit’s end. Could it simply be that it is empty? Would appreciate it if you take a look. Thanks a million in advance! @Jarle – try downloading again. I just installed a download counter plugin which may have caused it to show up empty. Huh… I tried once more, to little avail, I’m afraid. But still hope for a solution. The theme is definitely worth waiting for. Excellent! Didn’t try it yet but I’m definitely creating some project to use it h yes! Hope I can give you back something in the near future. Michael – phenomenal theme. Many thanks. I’ve been trying to use the thumbnails on my posts used the custom image field. I’m having an issue where the image doesn’t come up on the post or the home template (with the exception of a grey box) but it pops up when I click on the grey box in the post. Any guesses? Update: I’ve gone through the support for timthumb – changed my permissions accordingly – and still no thumbnails. Nothing is generated in the cache. Did you ever figure out why you get grey boxes? I’m having the same problem. Image pops up when I click it, but small grey box on blog page. What a spectacular theme! Love it! Excellent theme, I would like to download this theme. Can some one help me to find the download link of this theme? Thanks for sharing such an awesome theme! I searched high and low for a great looking theme that was well suited to both blog and more traditional content and this is perfect. I’ve a quick question for you – is it possible to make the large images (eg, slide1, slide2 etc) on the homepage clickable? If so, how would I do this? yes you can. the best way is to include the link and style it with a large background image in the css. I’ll do a bit more research and try that. Hi, very impressive Theme, I love it. But I have a slight problem: If I use links in my articles, they disappear in Article view. If I view the single post, the hyperlink is still there… Could you please give advice to solve this problem? Thank you so much. Allright, I found out that the problem lies in the theme. It is using “the_excerpt();” in the article-view. It seems, that links are forbidden in this view. I changed it to “the_content();” and voilà, there are the links. Not a very nice solution, though. Do you have any suggestions how to allow hyperlinks in excerpts? Excellent Work:) What is the easiest way to custom hyperlink the small images in the rotator on the homepage? change the href value for each image. you’re right – I forgot the those images are meant to control the slideshow. if you want a customized bar underneath the slideshow – just hide the original one (display:none) and create a custom one to replace it. Exactly where do I apply the template “template-home” to your home page? Love the theme! Would love a bit of help to get it working for me. I added a new page called home and selected the attribute Template Home and saved. The page was added but it still isn’t my “homepage” of the main url. It is still the Default Template style. How can I get my main url do be the Template Home? I would love a copy of the PSD. Please release it. This is an awesome theme! I can’t believe I have not seen it sooner! Really, great work. Quick question. How can I change the timing on the homepage rotator? I would like to slow it down slightly. Appreciate any help. Thanks. @Nick – in the theme folder, go into scripts, rotate and open “rotate.js”, you will see at the end of the script: “.tabs(’rotate’, 2000)” – the “2000″ is 2000 milliseconds – change that to a higher value i.e. 5000 is 5 seconds. Really smartest theme i’ve ever seen, nice thought!!! I am having trouble finding the code that controls the rate at which the slide images in the home template transition. Can this be controlled, because they change too quickly for my intended use. Thanks again! @TBarrios – in the theme folder, go into scripts, rotate and open “rotate.js”, you will see at the end of the script: “.tabs(’rotate’, 2000)” – the “2000″ is 2000 milliseconds – change that to a higher value i.e. 5000 is 5 seconds. This is a great theme, thanks so much for making it available. How would I go about changing the amount of time the home page slides are displayed? I’d like mine to be a bit longer before it autoscrolls to the next. @Rory – in the theme folder, go into scripts, rotate and open “rotate.js”, you will see at the end of the script: “.tabs(‘rotate’, 2000)” – the “2000” is 2000 milliseconds – change that to a higher value i.e. 5000 is 5 seconds. Could you please tell me how to divide a post into many page like the demo ? @Nguyen – the “Next Page” shortcode is: http://fearlessflyer.com/wp-content/uploads/2009/07/nextpage.jpg. Make sure you’re under “html”, enter the next page where you want your posts to split. That’s so great. I tried to use the shortcode but I wrote wrong code [Next Page]. Thanks for you help! Your theme is really pro. It must used as a business website than a normal blog. Is there anything wrong with the custom field ? I assigned a custom field as in the instruction but i didn’t work. I installed this theme offline with XAMPP. the value should be the full url of where the image is. At last I found the problem with the thumbnail, it must be upload to the host. I gave it the link to an image on other site so i didn’t work. Awesome post, these themes are very inspirational!Thanks for sharing. ermm.. nice idea … this is great.. thank you..
How to use photo gallery template? Yes, I would like to know this as well. Following the directions on this page have not produced any results. All of the variations I have attempted have been equally unsuccessful. Apparently I am just that stupid. A little hand holding would likely go a long way. Thanks. @mame, @TBarrios – the photo gallery template pulls image custom fields from your post. So all you have to do is apply the Photo Gallery template onto a page and that’s it. Another great theme. I love it. Just needed a little help. When I got to widgets and add widgets to my footer, they actually do not replace the default widgets. How to remove or replace the default footer widgets..? I filled the footer with dummy HTML for demonstration purposes only. So go in footer.php (under Appearance > Editor > Footer.php) and you will see there’s 4 blocks of dummy HTML code you have to delete manually. This is an awesome WP theme mate! It have a very professional looks. This is a fantastic theme. I love the simplicity, exactly what I have been looking for. Would love the .psd files for editing. Thanks again. no doubt, this is one of the best free wordpress theme. I am going to check it out for my other site. I hope you will release the psd files, or at least please send them to my email address as I want them to setup my blog. Full credit to your work. Michael, this is really nice work. Keep it up. I saw your stuff on Themeforest and Twitter brought me in.